Next up is designer extraordinaire Yana Smakula. "Hello, friends! This is Yana Smakula and I am so excited to participate in Papertrey Ink annual online stamping event – Stamp A Faire! In my video tutorial I'll show you how to turn simple paper die cuts into beautiful iron-looking embellishments for your project." Die cut desired shape you’d like to turn into faux iron embellishment. Remove die cut from the cardstock holder, if needed zap with a heat tool again to smooth out the edges. Cut thin paper to 4 ¼ x 5 ½ “. Cover with double sided sticky tape. Adhere colored cardstock pieces creating a bold geometric background. Arrange heart outline dies on the background, tape in place with washi tape (making sue to connect both dies – keep them connected) and run through die cutting machine to cut. Set aside. Die-cut identical shape out of white cardstock. Follow instructions to create faux iron embellishment. Adhere large negative background piece onto A2 card base. Finish the background by adhering small negative piece. Heat emboss “Happiest Anniversary Wishes” in silver embossing powder. Foam mount onto the card across the heart. Embellish card by adding Nuvo Drops or stamping images from the Gathered Garden stamp set in Watermark ink or both. Now it's your turn! Create a project featuring a metallic embossed die-cut. You can choose to re-create the exact project from Yana above or design your own using the same concepts. Your project must also incorporate at least one Papertrey product. Post your project on your blog, in your gallery, Instagram or on any other photo-hosting site (such as photobucket or flickr). Add your project to the InLinkz list below. You will have until 7am ET, Thursday, August 31st, to add your link to the list to be eligible to win. One project per person please. As a reminder, you will have until 7am ET, Thursday, August 31st, to add your link to the list to be eligible to win. One randomly selected winners will be chosen from all of the InLinkz entries on this post on Thursday, August 31st. The winner will be posted on our Thursday night Stamp-a-faire winners page after 9pm ET. The randomly selected winner will get a $20 PTI gift certificate to spend however they like! One randomly selected winner will be chosen from the comments of this post on Thursday as well. You will have until 7am ET, Thursday, August 31st to add your comment and be eligible to win. The randomly selected winner will get a $10 PTI gift certificate. How did you like the way Yana did the color blocking here? A great way to use up scraps, right? The elegant look she achieved with the inlaid die-cut that's coated with heat embossing is just awesome. I can image it in all kinds of different metallic hues, and lots of different die-cut shapes. We look forward to seeing your take on this! Yana, I love your “iron” heart. I just have to say, WOW! I just need the die and I am going to follow your great tutorial! Thanks for the great video! Such a pretty card! I love the iron heart! I love the background…it reminds me of an old dress from the 1960s. The cards graphics are stunning. I love this awesome technique! A beautiful design! I love everything about this card. I really do need to get that die. Every time I see I project with them, I curse myself for not having them yet! Great card and terrific technique. Thanks for sharing. Cheers. What a bright and happy anniversary card =) and fun technique. Oh my goodness, I absolutely LOVE this technique from Yana. But I love her cards even more – so fun and original and cool! Can’t wait to try this one. Very pretty! I love that heart and the way in is cut into the card. The heart is great! Do you have an embossing recipe or hints for iron? Very pretty card and the iron heart is so lovely. Love your videos and this is no exception. Thanks for the inspiration. Wow, I love that heart iron embellishment you created. I may need to get those dies now. Such a wonderful technique. Love your beautiful card. I love this card and the “iron” technique. The colors are so pretty with the iron heart! Love the background of this pretty card! The ‘iron’ heart is just beautiful! Yana, I loved your card. It has a wonderful design and easy to produce. Simple yet very elegant! Such a simple but striking card! Love your “iron” heart and I hope to get a chance to try out your technique. TFS! Color blocking is always FUN and the look of your iron heart is great ! Love that metallic embellishment- I just want to touch it! Love how the iron heart stands out against the cardstock blocks. Thanks for the inspiriation! Great card! Love the iron heart! I need to try this! Great job Yana! I always enjoy your videos! Love the color blocking with the metallic die cut! Simple and very striking. Yana’s color blocking is awesome! Gotta love a way to use up cardstock scraps. This is so cool! Looking forward to giving it a try! Love the handle tip too. I will to that a lot!! Wonderful technique I kind of forgot about… I should use it more often as it really gives an EXTRA to any card. I love this technique and have used it a lot. I especially love using a bronze color. Pretty card! so simple yet beautiful. lovely card and love your colors. Another favorite card for me. Loving the blocked colors! You make it look so effortless Yana! Such a pretty card and great technique! Thank you Yana for the tutorial it was very good. I like the tip on how to make a handle for the diecut when embossing it. It made it so much easier to emboss. This is a great technique, Yana! I always come away with inspiration when I see Yana’s creations. The card is beautiful! And, welcome to your first Stamp-a-Faire! Love the thick embossing created on this die! Fab technique and card!! Beautiful cards. I had never thought to do several layers of embossing. It looks wonderful and I’m definitely going to give it a try. Love this Yana, thanks for the inspiration. I can’t wait to try this technique!! I have used this technique in the past but it’s been a while. Thanks for the reminder. I just love turning paper into metal! this is fantastic, thanks for sharing ideas! An interesting technique I will have to give a try. I love the look of several layers of embossing powder on card stock. It changes a simple die it into a metal looking embellishment. Really love this simple designed card that really shows off the iron heart. Love the color blocking…with the faux iron heart…awesome! Gorgeous. I will be doing this!!! That layered embossing looks so rich and smooth. It really adds an extra something. Different ways to use up scraps is always welcomed, and this technique is very clever! I’ve never seen it before. I’m looking forward to giving it a whirl. This is so cool looking! I have done a technique similar to this before so why not try it again. I have my first attempt waiting for me to finish but I had to step away for a few. Hope to complete soon and get it posted. You make it look so easy, love videos! Love the bright blocks of color with that iron heart. Love the color block idea. Will definitely use this or my Christmas cards…Pure poppy, Lime aid Ice, Aqua mist and one of the pinks. Love how the “iron” heart looks! Great use of color blocking and inlay of dies. Looking forward to trying this. That heart is so cool and totally looks like iron. Awesome! I had an uh-huh moment watching your video and how you did your color blocking. So much quicker than how I’ve done it in the past. Love your “iron” heart and perfect for an anniversary or wedding card. You are the queen of awesome video tutorials, Yana! This iron heart is fabulous! I love how boldly it stands out on your card. I love the bold background and inlaid cut! Love the color blocking and this technique is definitely something I will try!! Yana I absolutely love watching you create. This card is simple yet bold and sophisticated. I am trying this design 1st thing tomorrow. Thanks for the inspiration!! Beautiful cards, love the techniques you used. Thanks for a lovely video. Great cards! I love the iron look of the multi-layer embossing. Going to have to try this one! What a great technique. The lay out and look of the card is just perfect! Wow! I love this technique! Beautiful cards! I love your super pretty colour blocked card! I love the clean & simple graphic look of these cards. I copied the exact same color scheme because it’s so pretty! Can’t wait to make a whole set of this stylecard in different colors. Yana, thank you for the very thorough video. I learned several new ideas. Love the faux iron look, the color blocking idea and even the idea of making a handle to hold the heart while you embossed! Lovely card and a really cool technique, thank you Yana! This one took me a while to think about, but I do believe that I have it! So appreciative for the inspiration. Have a great day! Fabulous card, Yana! Love the color blocking and your fun “iron” heart! This technique will be perfect for upcoming Birthday cards and a 25th (silver 🙂 Anniversary card I need soon. Thanks for the helpful tips for embossing too! What a great tutorial! I love the way this looks! Cool technique! I love this die! LOVE the iron look heart on the color blocked background! Thanks for the embossing tips for building up layers too. Yana, your card is beautiful-love this idea. Also thank you for your videos, I always learn something from them. very cool heat embossing inlay technique!! Love the inlaid embossed heart! Beautiful and elegant! Love the heart! Not only do I enjoy learning new techniques during SAF, but I’m happy to pick up tips that will be used more frequently. Yana shared one in her video – heating the embossing powder to smooth it when the die cut is removed from its “handle.” It was one of those “duh” moments for me. Yana’s work is always so inspiring! Loved the results of this! I look forward to trying this technique! Thanks for the great video Yana! I loved to watch the tip for color blocking on the card front, and the iron heart looks so cool inlaid into the panel. Yana makes such beautiful cards! I’m so glad she has a regular feature with PTI. This looks like molten metal. Too cool! One of my favorite projects. I’m trying this out at home tonight. Great technique! I have to try this more often. I love the look of the embossed inlays. This was fun to do, and the best tip ever, to make a handle from scrap for embossing!! Thank you! I love this faux iron inlay! Beautiful project! Super cute! Color blocking is so much fun! Thanks for sharing and the tips! Awesome- so glad we did this one too! Love how you made this embellishment. Surely inspired to try. I love the way you used the negative space of these two dies in a completely outside the box way. Yama thank you for your wonderful tutorial and inspiration. Your card is stunning. Honestly looks like iron! Loved this technique, and will use it often. Thanks, Yana! I love your color-blocking! Thanks for the inspiration! Your inlay is so cool! Some day I’ll try doing the inlay, too. Love this idea of using the traditional anniversaries for PTI’s 10th! Brilliant solution to the problems posed by Versamark for this technique… I didn’t get it all over myself like I usually do! Love how you made the background, Yana! So simple yet so stunning. Thank you for sharing your amazing card! It is so beautiful! I love this technique! 2017 SAF was THE event of all crafting events! I loved that there were 3 days of fun crafty activity! I managed to complete 14 of the 21 challenges. SO MUCH FUN!! Thank you so much for putting on such an amazing event!! Haven’t done this technique in a long time–love it! I didn’t get to participate in this challenge, but I have done this technique before. It is wonderful! It was a great idea for Stamp-A-Faire! Yana’s card is so striking. The bold color blocking contrasts so well with the heat embossed die cut. I can’t wait to try to combine these two elements. 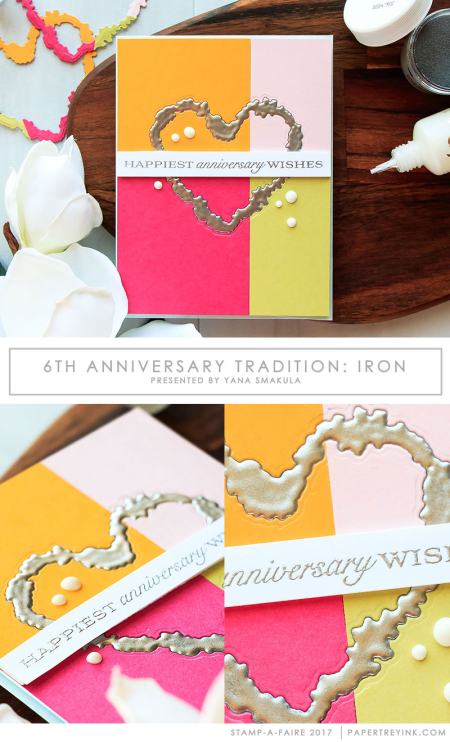 Love the very modern look to Yana’s card…from the color blocks to the free form heart. Perfect!